Nantwich & District Motor Club magazine. Homepage. This page: A club magazine published in 1966 for car and motorcycle enthusiasts in Cheshire. 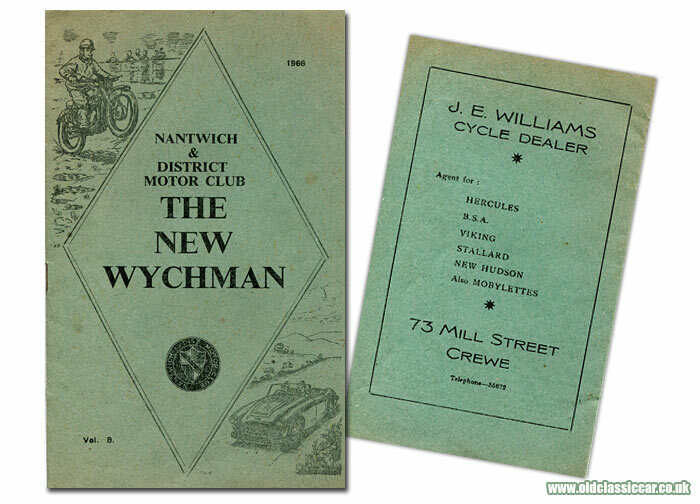 "The New Wychman" - Nantwich & District Motor Club. Volume 8 No 5 issue of The New Wychman, the Nantwich & District Motor Club (NADMC) members' newsletter, dates to September/October 1966. Although described as a motor club, and featuring both motorcycle and car (Austin-Healey) on the newsletter's cover, the contents concentrate on motorcycle- rather than car-related news and competition items. 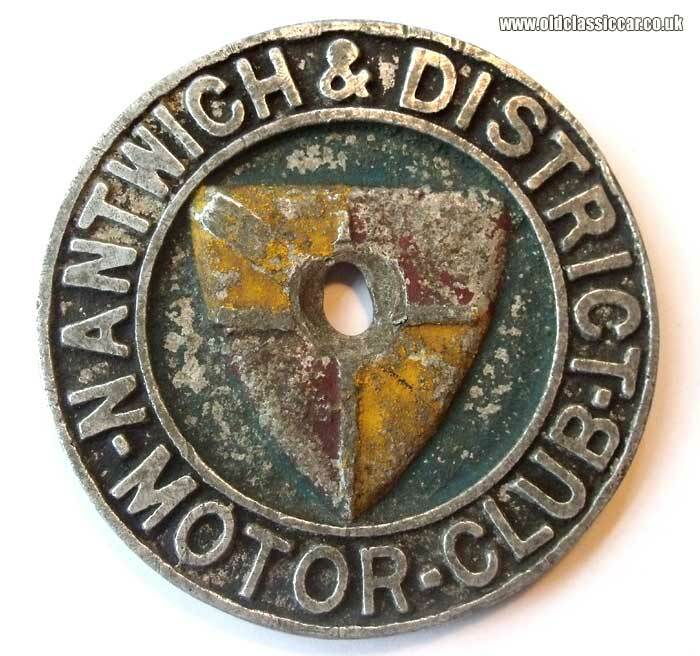 Apparently the club - which was founded in 1932 - is still in action to this day, although there are few references to it online, other than occasional mentions in relation to itself and the Cheshire Motor Cycle Road Club Ltd, with whom it now seems to be affiliated. At the time, membership of the NADMC cost 12s 6d, with car grille badges (see below) a further 10s (50 pence in new money). Inside the front cover, the club officials are listed, their locations spread evenly around the locality, most being in Crewe and Nantwich as you'd expect, with one or two living further afield, such as the Assistant Sports Secretary, who lived over the Cheshire/Shropshire border near Malpas. The club headquarters were located at The Leopard Inn in Nantwich, the scene of many club meetings, film shows and so on. The rear cover of the newsletter features an advertisement for bicycle dealer J.E. Williams, of Mill Street in Crewe, a sales agent for Hercules, BSA, Viking, Stallard and New Hudson cycles, and also 50cc Mobylette mopeds (an example of which I have lurking in the garage). The newsletter measures approximately 8" x 5". Articles are typewritten, with no accompanying photographs. The Editorial discusses recent events at the club, and news that the BBC (via the Cheshire ACU - Auto Cycle Union) were interested in televising a "TV Bandstand Scramble" programme, at the club's Hatherton Hall scramble course, or "Motocross" course as it'd now be referred to. With agreement given, this was due to take place on November 19th 1966, and would mark the first occurrence of an international event taking place at Hatherton. Entrants were expected to head to Nantwich from Russia, Czechoslovakia and/or Belgium. "Dabber" continues in the following pages to discuss other matters that he/she had come across during recent weeks. The problem of encouraging more people to help out with the organisation and running of events, seems to have been an issue with the NADMC, and is still a complaint often bandied around within other club circles to this day. A centre core of regular helpers tend to take on the burden of work and responsibility before, during and after meetings, with new blood being particularly tricky to attract. Effective communication from the regulars to potential new helpers, and offering to explain what to the former might seem like obvious tasks, are highlighted as areas to improve upon if new help is to be found. The same contributor then turns their attention to the rash of new road signs that were popping up left, right and centre across the area. Few, with the exception of motorway signs, were reported as being genuinely useful, and could in fact be counter-productive by trying to disseminate too much information at once for the rider or driver to take in. This is something that often bugs me even now - how many reminders are really necessary for a change of speed limit? Do I really need to know, for instance, where the latest housing development is situated? Whereas sat nav was unheard of in the 1960s, nowadays most people seem to use it (myself being an exception), so really other than key directional, speed information and warning signs, do we really need all the other roadside clutter? But I digress, so back to 1966. In addition to motorsport activity, members could also be found competing in other sporting arenas. On the 2nd August, a Crewe vs Nantwich cricket match took place at the Vagrant's Ground, the former team winning the match under leaden skies. Of more interest though is the report on the 1966 hillclimb held at Beeston Castle, although by its description it sounds more like a trial than a hillclimb, in that it took place up a muddy, rutted, course, rather than on a tarmac (or similarly smooth) course. The hillclimb was organised jointly by the NADMC and the organisers of Bunbury Parish Fete. While the weather looked promising, by 3pm the rain began to fall, and the "machine examiner" (scrutineer) was seen to be undertaking his checks beneath a sizeable fishing umbrella. Happily the weather improved by the time of the first run, and the attempts by riders Roger Kyffin, Phil Bright, Peter Stones, Ted Wood, Fred Spann and Ted Shaw drew particular praise for their exuberance. Naturally the objective of the climb was to reach the summit, and riders Eric Adcock, Frank Bainne and Frank Yarwood were the trio that succeeded in this quest. To decide an overall winner, run-offs were completed, with the overall honours finally going to Eric Adcock. By the end of the day, Mr Adcock would be crowned Cheshire Centre Hill Climb Champion, for the second year in a row. His machine - a 249cc DOT. The Crewe Trial, held on 21st August, was won by Harvey Lloyd, while the Nantwich Team, competing in an Inter-Team Club Scramble organised by the Manchester Eagle Club, came in second place. A brief report of race meeting held at Oulton Park in September is also given, while congratulations to local rider Stuart Graham, who came 2nd in the 250cc event at the Isle of Man TT, and to Keith Heckles who finished 2nd in the 350cc event at the Manx Grand Prix, are also passed on. The final page lists the remaining club activities scheduled for the remainder of 1966. The Annual Ball was due to take place at Nantwich Civic Hall early in October, while on the 18th of October a film show was penned in for The Leopard Inn's regulars. On 6th November, Sycamore Farm - "at the top of the Copper Mines, Bickerton" - would play host to the November Trial, while on 15th November The Leopard would see members enjoy a "Reg. Spencer special" film evening. The club would hold its annual AGM in December, followed a few days later by a children's Christmas party. Mention of the scramble held at Hatherton Hall, a few miles outside of Nantwich, has already been made. This track was, apparently, a regular venue for Nantwich & District MC meetings even in recent-ish times. The venue still has a licence to hold such events, other websites suggest, and buildings used at these meetings (eg race control) still stand but haven't been used for several years. There have been attempts to resurrect these popular meetings, but indications are this hasn't happened as yet. 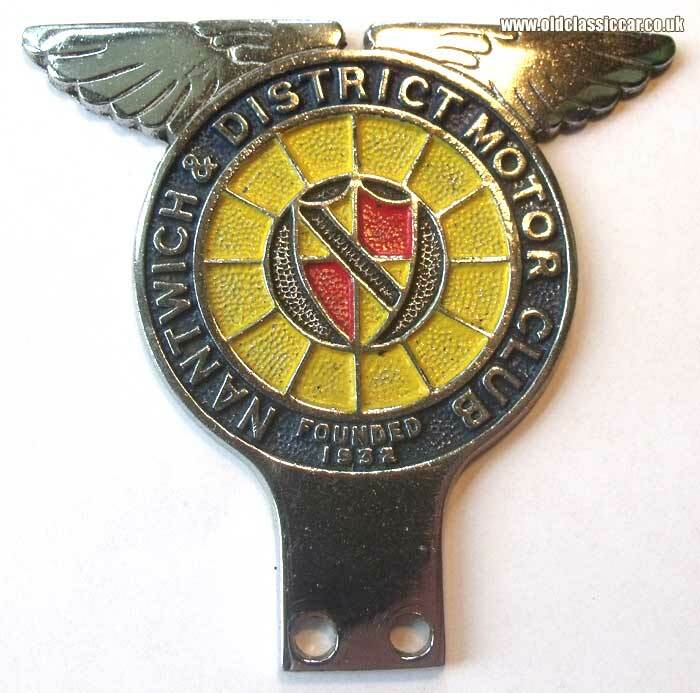 So far I've come across two versions of the Nantwich & District MC car/motorcycle badge. The earlier example, which probably dates to the 1930s or 1940s, is made in cast aluminium, and measures approximately 3.75" diameter. While the centre locating hole has worn somewhat, it's in otherwise fine fettle. The design symbolises a road wheel and tyre, with the shield of Crewe and Nantwich within it. Coincidentally, as a nod to the area's involvement in the railways, the full crest of arms for the two towns incorporates a wheel - albeit a locomotive rather than road vehicle wheel - in its design. This badge spends its days screwed to the front of my 1930's Morris, and I wouldn't mind finding a second example. The later version shown below, probably dating to the 1950s, is a cast design that has then been chromed. A spoked wheel forms the backdrop to its design. Whereas the previous design lends itself to being affixed to the radiator of a pre-war type of car, this later version was intended to be affixed to a badge bar, of the type popular in the 1950s and 1960s. It also now mentions the date of the club's formation, 1932. For a club that seemingly was very active in the area from the 1930s and well into the 1970s and beyond, there seems to be little information regarding its history on the internet. There must be hundreds of photographs and anecdotes out there, surely? I'd be happy to feature any old documents, photographs or stories that relate to the early years of this club on here. If anyone can help out with information, say dating from 1932 through to the 1970s (broadly the eras that this site concentrates on), then please do drop me a line, my contact details are on the homepage. Thanks.